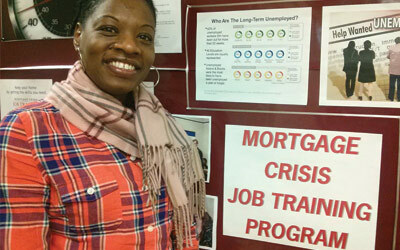 Responding to the escalating mortgage crisis, the Connecticut General Assembly developed the Mortgage Crisis Job Training Program in 2008 and designated that the American Job Centers be a resource for borrowers in danger of foreclosure. The WorkPlace was named the coordinator and fiduciary for this statewide effort to help at-risk mortgage borrowers. The Mortgage Crisis Job Training Program helps homeowners who are behind on their mortgage payments become current by increasing their earning potential. The program is designed to help mortgage borrowers increase their job skills and become more financially stable. To be eligible for the program, applicants must be 60 days or more past due on a mortgage for their primary residence in Connecticut and have an annual household income under $120,000 or demonstrate an imminent need for the program’s services. Additionally, referrals are accepted from the Connecticut Housing Finance Authority. The program is offered at no cost through The WorkPlace in partnership with the Connecticut Housing Finance Authority, Capital Workforce Partners, and Connecticut’s workforce system. Click Here to learn more about employment opportunities. YouthWorks is a program of the WorkPlace. Services and programs are funded through the Workforce Innovation and Opportunity Act (WIOA). YouthWorks is an equal opportunity employer/program and auxiliary aids and services are available upon request to individuals with disabilities. This document was supported by Grant 90FX0043 from the Administration for Children and Families, U.S. Department of Health & Human Services (HHS). Its contents are solely the responsibility of the authors and do not necessarily represent the official views of HHS. HPOG is a study funded by the federal government which is being conducted to determine how these training opportunities help people improve their skills and find better jobs. During the study, all new eligible applicants will be selected by lottery to participate in these training opportunities. Not all eligible applicants will be selected to participate in these opportunities. This workforce product was funded by a grant awarded to the Connecticut Department of Labor by the U.S. Department of Labor’s Employment and Training Administration. The product was created by The WorkPlace and does not necessarily reflect the official position of the U.S. Department of Labor. The U.S. Department of Labor makes no guarantees, warranties, or assurances of any kind, express or implied, with respect to such information, including any information on linked site and including, but not limited to, accuracy of the information or its completeness, timeless, usefulness, adequacy, continued availability, or ownership. This product is copyrighted by the institution that created it. Internal use by an organization and/or personal use by an individual for non-commercial purpose is permissible. All other uses require the prior authorization of the copyright owners. The Heath Career Academy, Sector Partnership National Emergency Grant, and Strengthening Working Families Initiative are WorkPlace Opportunities. They are equal opportunity programs and auxiliary aids and service are available upon request to individuals with disabilities.